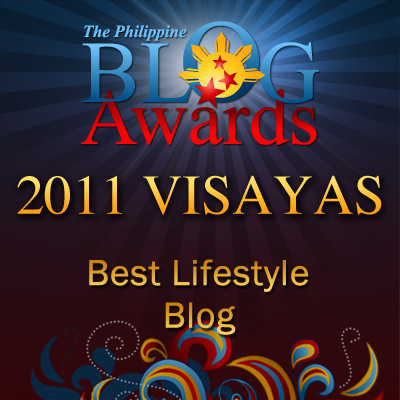 Random Thoughts of Gil Camporazo: Who Kills Garkitty? 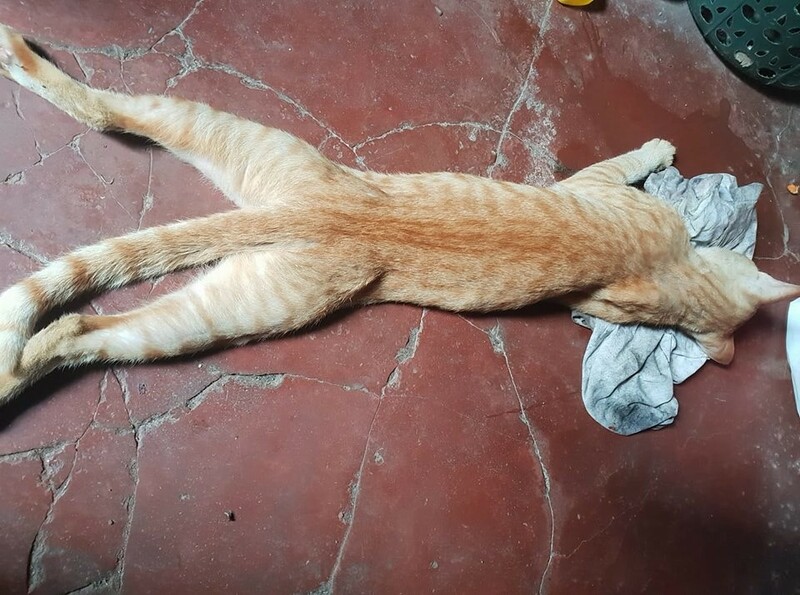 We miss our fave cat, Garkitty that passed away early this morning due to poison. Those culprits are so lucky for we're not able to identify them. Hope Garkitty would find justice sooner or later. As of now, we are facing a blank wall. It is more than fun of giving names to three little kittens sired by our controversial, domestic cat, Garfol. 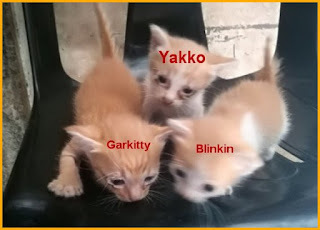 The names of three little kittens were chosen through a draw lot. All the names suggested by myLot users were printed, cut and rolled. They were placed in the smile plastic mug. And the names were picked by Inday Sophie and our youngest son as suggestion made by rebel_woman06 @SIMPLYD that it is best that the pet owner be the one to name them like your youngest son and Sophie. Inday Sophie drew the names of two female kittens and they're as follows Garkitty by ilocosboy and Blinkin by Nanette Piotrowski. Our youngest son drew the name for the male kitten and it's Yakko by RealIolo. 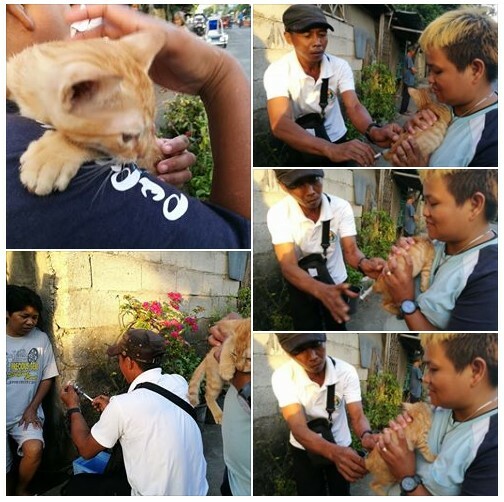 Late afternoon of February 2018, Garkitty got her first anti-rabies vaccination from a roving government employee who went house to house to vaccinate domestic animals like cats and dogs. Garkitty, 3-month old kitten while being injected was cradled by our third elder daughter. While the syringe and the ampule of the vaccine are being prepared, Garkitty knows what has to be done to him. He just behaved until the administration of the vaccine was done. Inday Sophie whose pet is Garkitty was very happy. Garkitty is now safe. But the fateful day, Garkitty didn't survive from poison given by those heartless neighbor we have. We're very sorry for we have no suspect for the culprit. We really miss him. He is now permanently resides in our heart and in our memory. Garkitty is our pet cat. He is one of the offsprings of Garfol. He has survived his other two siblings Blinkin and Yakko that died in their early days. 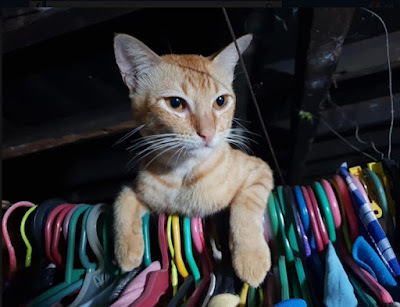 Sometimes in March 2018, I was shocked upon seeing Garkitty's in my youngest son's facebook page. 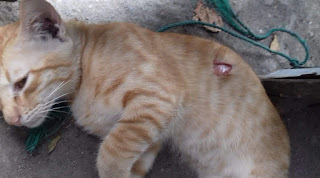 Our 4-month old cat was wounded by a homemade arrow that pierced to his left shoulder passing thru to his left armpit. He was seen by our third elder daughter lying on the floor, quivering. First aid was applied to control his pain. He's not brought to vet for it's already night time. Vet's office was already closed. I pitied the innocent Garkitty. I couldn't control myself from crying. Everyone in the family cried too. Garkitty is a good cat. He plays with us. He's the best mice and rats catcher. Everyday he killed two to three mice. In the morning of November 4, I felt so heartbroken when our youngest son posted Garkitty's lifeless body prowling on our floor. His post stated that our fave cat is poisoned. I couldn't help myself by shed a tear of pity, a tear of loss. I wasn't at home for I was attending the 2-day Young Single Adults Conference of the Church as a media specialist. Our neighbor is so heartless. They're too cruel. They're too unkind our our poor Garkitty. Now he finally passed away early this morning. He died at the age of 11 months, barely a year staying with us. Garkitty is now survived by his sire, Garfol. We're praying that justice be given to our poor cat, Garkitty if not now in the later days, months or years to come. Garkitty, we really miss you. We are very saddened of your untimely death. I'm sorry to read about your beloved cat. If you ever find the perpetrator, I hope you file a case against them. And since you have other cats as well, please look after them and if possible, keep them indoors permanently. Again, my condolences.